Not without trepidation do I write an unflattering review about this particular drinking establishment and if I’m ever in there again when The Waverly Brothers start singing I’ll be leaving very swiftly. 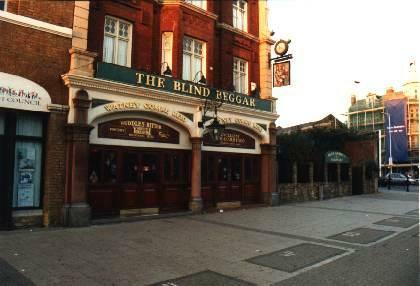 A Whitechapel stalwart and an institution The Blind Beggar is these days sadly sub par and isn’t helped by now being flanked by a massive Sainsburys and in an located area which has seen better days. It doesn’t take Julian Assange to dig up the dirt on the shady past of this pub; frequented by gangs of thieves, crooks and dodgy folk throughout its history the prime reason for visiting is to feel a connection to this chequered history. Whitechapel itself is of course synonymous with Jack the Ripper and although his nearest victim was eviscerated a fair walk away from here there are more than a few walking tours that guide their gullible herds of merry gore seekers into this pub. The place itself is pretty standard and painfully overpriced considering the surroundings. Furniture that would look more at home in the garden has somehow found itself inside and is about as comfortable as a sitting on a wet paper bag full of broken glass. There is a pool table towards the back (a rarity in these parts) but it’s located adjacent to the bogs and only really serves to provide a sightly more secluded alcove to hide from some of the more surly looking locals. Sadly I think that this pub is trading on one thing alone which is of course a nice grizzly murder or two. Some places are content to boast that Shakespeare might have drunk there or Wordsworth had a piss against the bins out the back once but these establishments still tend to make an effort with other things like comfortable seats and heating. Apparently though if one of the Krays wandered into your bar nearly 50 years ago and blew some poor sods brains out mid pint you don’t need to bother with any of the bits that make a good pub because people will come anyway to imagine the smell of cordite in their nostrils and the faint plopping noises of grey matter landing in their pints. I’m honestly searching my notes and my memories for something positive to say but I’m at a loss. Go if you want to visit the scene of a very old murder but not if you want to enjoy your beer. If I were you I’d just stand outside and follow the first passing siren to its destination on a Boris Bike and you can almost certainly visit the scene of a much fresher murder and inevitably find yourself outside a less rubbish bar.